Helping your day come together smoothly. We are able to accommodate for all sizes of event from small parties at home, to formal events, where the facilities need to be of a ‘five-star’ standard. Single cubical – basic toilet and hand-wash facility, suitable up to 40. 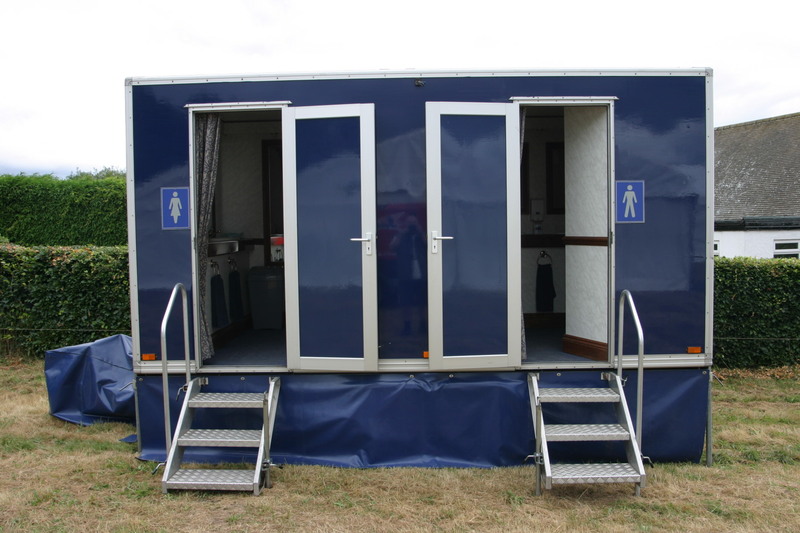 1+1 – top quality Ladies and Gents toilet, with vanity unit, hot & cold water, heating, carpet, wallpaper, large mirrors, piped music, up to 100 guests. 1+2, 1+3, – same specification, but with higher capacities up to 250 guests. 1+4 – a high-spec toilet, brushed aluminum & beech wood finish, with a DVD entertainment system, up to 250 guests. All of the toilets that are provided by us are of the highest standards available, and are complete with soap, towels and toilet paper..
All of the marquees can be heated, obviously the larger they are and the colder it is then the bigger the heater. All of the heaters that we install comply with all safety standards, they are thermostatically controlled by you. 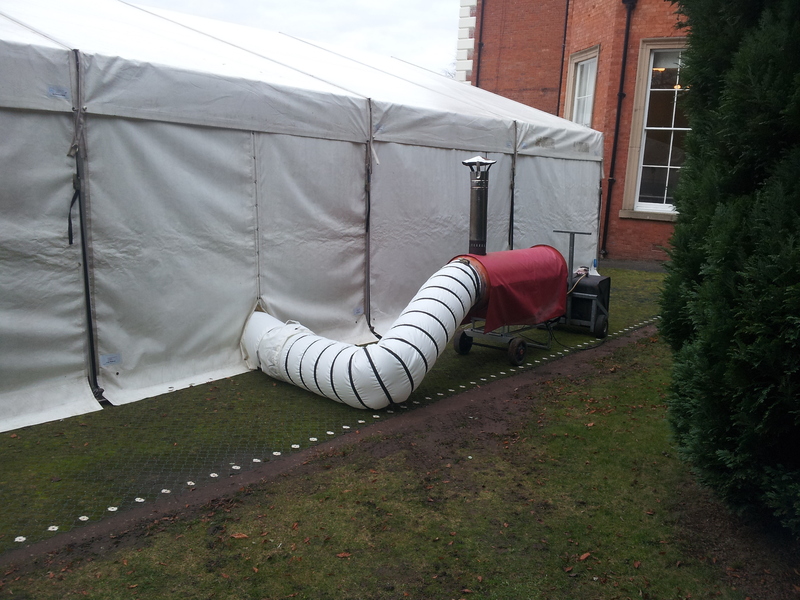 The heaters that we supply are all external indirect heaters, i.e… they are sited outside the marquee and only warm is ducted into the marquee. 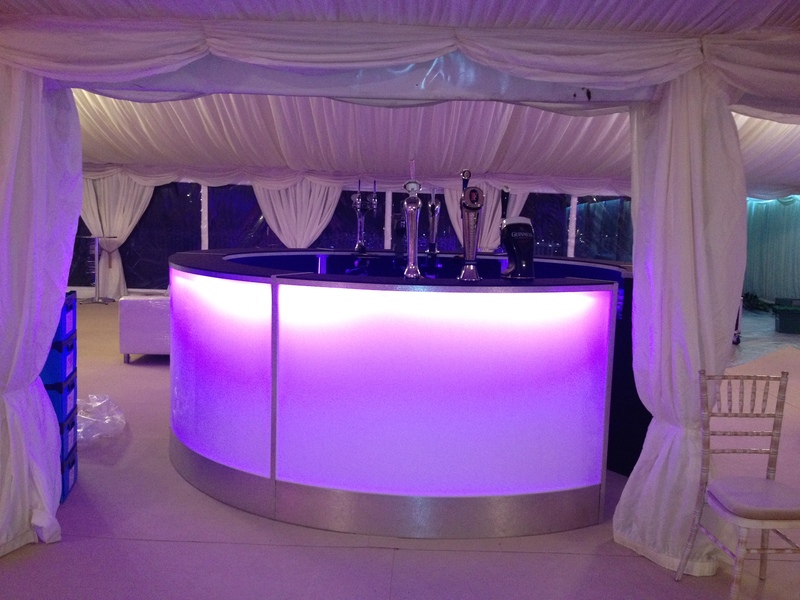 Marquees are hired all year round, and there are also times during spring or autumn when a heater is not needed during the day, but when the party is still on late at night, it can be a bit chilly. The power requirement is dependent on the activities within the marquee. We are able supply and install all necessary cables, fuse boards, lighting controls, and auxiliary power points within the marquee. If a suitable supply is to hand e.g. a house, office, etc. then we will take power from there. However, if this is not an option then we can install generators, complete with distribution boards etc. All the electrical equipment is regularly tested and inspected in accordance with regulations. This is a service that Marquee Leisure will happy provide – free of charge to any of our clients. We don’t make a charge for the services, we don’t charge a commission on top of any equipment hired as do ‘wedding planners’, Event organisers’, and ‘party planners’ etc. 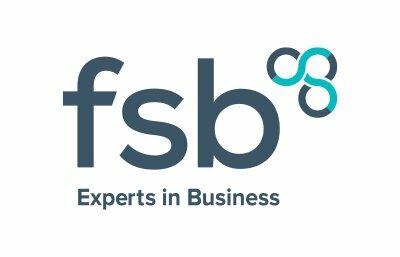 All the advice is freely available to all of our clients, as is any information for caterers, entertainers, florists, etc. Should you need hosts/hostesses, bar & waiting staff, or door staff & security then We can arrange suitable people for your event. If hiring toilets then these too can have an attendant. All of furniture etc. Is available for hire even if you don’t hire a marquee. Many organisations have facilities of large halls and gyms which events can be held in. 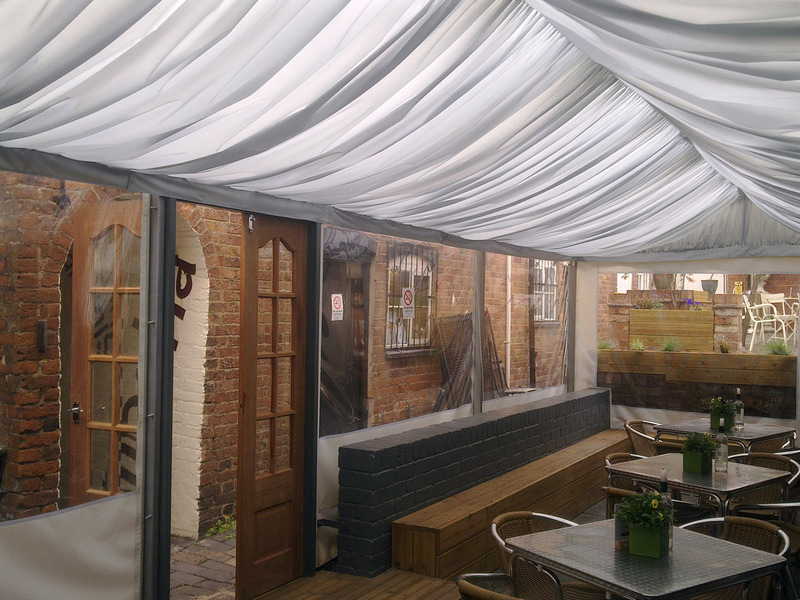 In many cases we are able to fix marquee linings to the room interior so creating the inside of a marquee, in some cases we just erect a marquee frame and fit the interior lining to it for the same effect. This is a service we offer that enhances a venue or room to create an Atmosphere and provide facilities to hold presentations, displays, exhibitions, etc. 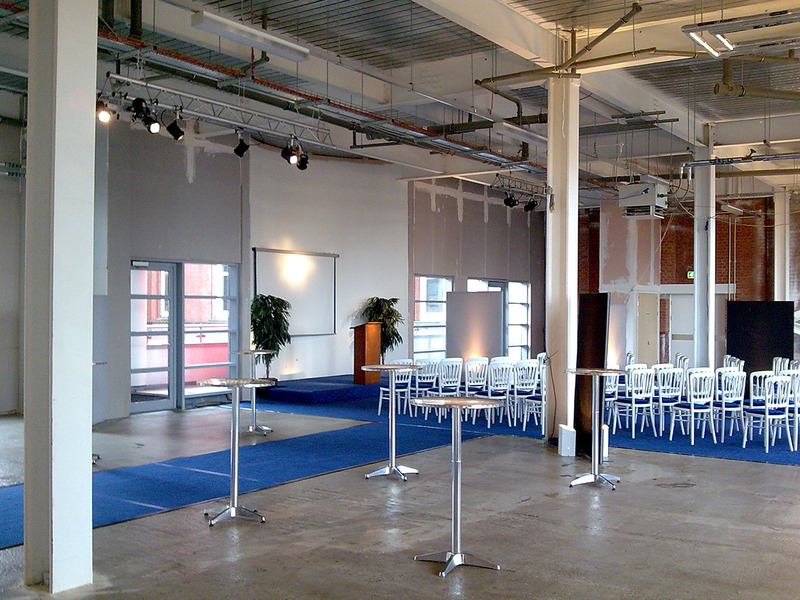 This range from Carpeting, lining, and lighting a venue for an event, to the supply of AV equipment and furniture etc.